About this time last year I heard a story about pies on NPR’s Weekend Edition Sunday. 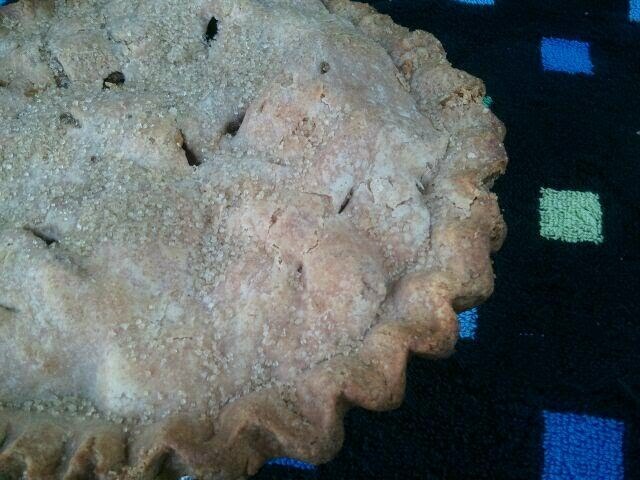 The guest spoke about the joy of making pies and encouraged the listening audience to bake a pie and give it to someone they cared about. It was a cold, wintry day and I thought that baking a pie sounded like a wonderful thing to do and so I inventoried the ingredients that were on hand and began to prepare a marionberry pie. But who would I give this pie to? As the pie baked, my thoughts turned to one lady in particular. She is a member of the church I attend and had recently lost her husband of many years. If I hoped to bring a bit of joy to someone, then she would surely be the most deserving person. Several hours later I delivered a warm berry pie to her house. She called a little bit later to say that her family had been wondering what to have for dinner when my pie arrived and when they saw it they decided that pie for dinner sounded perfect. Giving away that pie and receiving her thanks was such a great experience and that experience was one of the reasons for the creation of my pie journey. What has that story got to do with today’s pie? As it so happens, the lady who received that first (pre-blog) pie recommended today’s recipient. It seems that this man was especially helpful to her and her husband prior to his death and he has continued to be a help even without her asking. She told me how very much she appreciates his help and this pie is a way of recognizing him for the care and attention that he has shown. ← Day 295: Wedding Pie!